It is now 34 years since I had the good fortune to be attracted to the Game of Bowls. No very long time elapsed before I began to realise how much better my fortune had been had I been attracted earlier. For many years I had regarded the Game with an amused but ignorant contempt. In return it has heaped coals of fire on my ill-deserving head. It pitied my ignorance and took me to its heart. Much happiness has thus come to me, though I have won no great fame as a Bowler. But little have I recked, since other aims I early learned to prize. 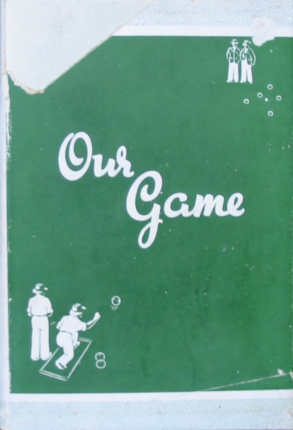 The book itself comprises: 49 short chapters that record his experiences as a bowler, usually with a philosophical interpretation and most containing a short poem or two; a 12-part chapter headed 'The Principles of Bowling' which includes practical aspects such as delivery, green and strength, various shots, etc; and the final chapter, 'Omar Khay-yam' for Bowlers'. The latter, based on the Rubaiyat of Omar Khayyam, is a 75-verse poem that combines John May's affection for the Rubaiyat with his passion for bowls. From the Foreword of Our Game and Omar Khay-yam for Bowlers it seems that the first edition, published ten years earlier, consists largely of songs that appeared previously in Bowls - a magazine believed to be primarily concerned with the state of Victoria - and that the title is Our Game.